I personally enjoy posting rumors because I think its good discussion and I know some people can't stand them, but this one might have some relevance to the Pens, so I figured it was worth a post. Rumor is that Heatley has waived his NTC to accept a trade to the Devils for Urbom, Tallinder and draft picks. Ever since his horrific car accident, he really doesn't drive to the net as much as he used to. First Kovalchuk, then Heatley (if true). Can't wait for Hossa. 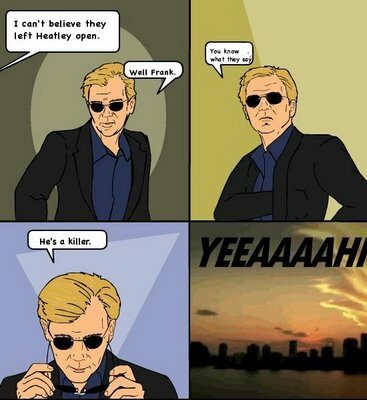 lol no, I know it's about the accident, just didn't get the "pun" part of the David Caruso thing. I think it's because he was left open in the slot and was able to bury it, and you can't leave a guy like that open, or else he'll "kill" you. npv708 wrote: First Kovalchuk, then Heatley (if true). Can't wait for Hossa. "Not Dany Heatley" on Twitter is usually pretty funny and he had a couple good tweets about the rumor. Not really board appropriate though. I think the point is more, all three have played for the Thrashers. Pens Fan Since 1970 wrote: Ever since his horrific car accident, he really doesn't drive to the net as much as he used to. That happened after his second season when he was 22, almost 10 years ago. Afterwards, the NHL missed a season, he was traded to the Sens where he was a key contributor. Since that event, he's had 2x50, 1x41, and 2x39 goal seasons. The summer after the accident, he lead Canada to gold in the world championships as the tournament MVP and since then has also had a successful run to the finals and contributed to a gold medal in the Olympics. He's Canada's all-time scoring leader in the World Championships. To correlate any change of play to the accident is really stretching, considering he was so young when it happened, the league changed drastically afterwards, and he went on to be a top player/goal scorer for five seasons after. For the past couple of seasons, he's been a shadow of his past, likely due to age more than any other factor. He was never particularly fast to begin with, not really a good skater...it's only gotten worse...this offseason, I think he put on a bunch of upper-body weight, which'll slow him up nice and good...he's a guy with a terrific shot, but not a lot else going for him right now...he tried to participate defensively last year more than ever, but I mean, there's just not a lot else to his game all things considered...he can finish, no doubt, but can he start...? That sound is his joke going right over your head. MRandall25 wrote: That sound is his joke going right over your head. I guess I'm not going to be writing the david caruso memes anytime soon. Last edited by Desiato on Sun Mar 10, 2013 1:26 am, edited 2 times in total. I didn't even write that. It's been on the internet for like 6 years.